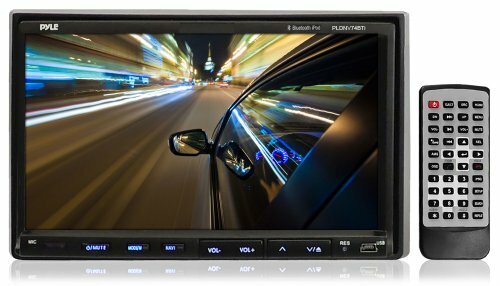 This multimedia touch-screen head-unit from Pyle is packed with features for the ultimate in-car entertainment system! 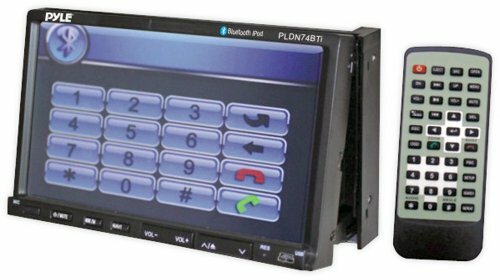 The motorized, slide-down front panel reveals a 7" widescreen TFT monitor with a 1440 x 324 resolution for maximum quality. This unit has an AM/FM tuner and plays CDs, DVDs, VCDs, and MPEG4s from SD cards and USB sticks. It’s also got a direct iPod/iPhone connection cable for a high-quality link between your favorite player and this head unit. And it’ll play music from a Bluetooth-equipped media player. Includes 30 radio station presets, anti-shock mechanism ESP function, and treble/bass/balance/fader control. A remote control gives you total wireless control of your headunit. With 320 watts total output (4 x 80 W), you’ll find your music and movies looking and sounding better than ever before on this double-DIN unit.Audio/Video Inputs: 1 Set of Rear Audio RCA Inputs, 1 Rear RCA Video Input. Bluetooth A2DP Support - Touch Screen Control Operation - Anti-Shock Mechanism-ESP Function - Subwoofer Output - Wireless Remote Control - Dimensions: 7.26" x 4.08" x 6.36"